Puerto Rico is narrowing in on passing 100 percent renewables legislation. The Environmental Defense Fund today announced a new initiative in Puerto Rico that aims to foster collaboration on low-carbon microgrid projects in rural communities. Through a three-year collaborative program, EDF plans to draw together regulatory, financial and community stakeholders to streamline the microgrid construction process. Though the organization said it wouldn’t rule out using fossil fuels in these installations, it plans to maximize clean energy and energy efficiency in their development. Before the end of the period, EDF aims to install at least one microgrid in one of its partner communities. The initiative was introduced during an energy summit hosted this week in San Juan: Black Start 2019, a name selected to reflect the rebuild of the island’s energy system that followed Hurricane Maria in 2017. It’s been about a year and a half since the hurricane tore up the island’s transmission and distribution, and experts are still working to clarify the vision for Puerto Rico’s electric system. Policymakers have gotten closer. This month, Puerto Rico’s Senate passed PS 1121, a law that mandates 100 percent renewables by 2050 (renewables stood at about 2 percent in 2017, according to the Energy Information Administration). The legislation also aims to empower “prosumers” with strengthened policies for net metering and interconnection of solar, storage and microgrid projects. The law includes several “important win[s]” for the solar and storage industries, including the RPS and processes to speed up permitting, according to P.J. Wilson, founder of the Solar and Energy Storage Association of Puerto Rico. 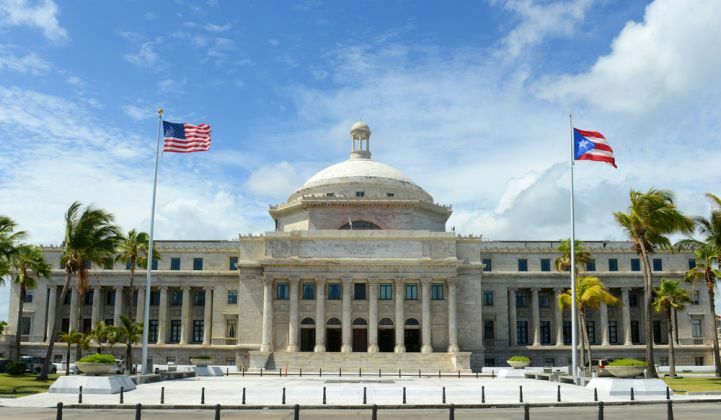 But watchers of the law thought it would pass the House of Representatives this week and move to Governor Ricardo Rosselló’s desk, where he is expected to sign it. It now looks like that vote won’t happen until next week. The vote holdup is likely temporary. But other processes have also been delayed, like the integrated resource plan (IRP) for the island’s utility, the Puerto Rico Electric Power Authority (PREPA). On March 14, the island’s regulatory body, the energy commission, rejected PREPA’s proposed plan based on numerous criticisms. In particular, the bureau said the plan didn’t adequately discuss details of the mini-grid structure proposed for the island or factor in attainment of the territory’s current 20 percent by 2030 renewable portfolio standard. Now, the utility is tasked with updating its plan and resubmitting it within 30 days of the rejection. The energy bureau has also reprimanded PREPA for not submitting a proposed interconnection regulation tied to microgrid rules the bureau finalized in May 2018. PREPA did not respond to a request for comment before publication about how close it is to completing that regulation or updating its IRP, which was prepared by Siemens. EDF’s microgrid initiative joins numerous community-focused and philanthropic efforts hoping to spur change amid that maelstrom. Marcel Castro-Sitiriche, a professor of electrical engineering at the University of Puerto Rico, Mayagüez, is working to promote a “bottom-up grid” that relies on home systems with 2 kilowatts of solar PV and 10 kilowatt-hours of energy storage. According to Castro-Sitiriche’s research, if the last 500,000 residents connected to the grid post-Maria had access to an islanded solar-plus-storage system, it would have reduced the blackout hours that Puerto Rico's electricity customers endured by two-thirds. “It is a social justice issue,” said Castro-Sitiriche, adding that the last customers connected are still those most threatened by large hurricanes that may make landfall in the near future. “My biggest worry are those who spent more than five months without electricity,” he added. In the longer term, Castro-Sitiriche and his students are working with communities on three possible revamps to the energy system: individual systems, nano-grids that encompass five to 10 houses, and larger microgrids. Though Castro-Sitiriche said his first choice would be a system that preferences energy at the point of consumption, thus reducing the need for a distribution network, he also believes the ultimate decision for what’s best should be made by the community. Since the storm, more communities have investigated microgrids as a way to guard against utility failure. Though EDF is hoping to ease the process to install those systems through its new initiative, Sandoval also recognized that moving forward with the project will require dealing with a significant amount of uncertainty.